Rooting out pseudoscience out in the world is a full time job for literally hundreds of people, but many of the writers out there tend to focus on a few things. This blog, for example, mostly focuses on creationism, the anti-vaccine lunacy, and rarely, global warming. Creationism, for example, has a long tradition of pseudoscience, so the arguments debunking creationism is well known, and the creationists more or less rely upon the age old fallacies, which convince the True Believers™ but make real scientists chuckle. It has really evolved (pun intended) to a static argument but there is no scientific controversy, it’s just evolution denialists on one side and real science on the other. If this were a real debate, it would be over and the creationists would be crawling back home in tears. The anti-vaccine fools are less sophisticated than the creationists, partially out of inexperience, but also because the so-called debate means lives of children. Even the True Believers™, who think vaccines harm children, at least are fighting for the lives of their children, despite being totally delusional about what may cause it. Creationists are just delusional, and are mostly harmless. Today in Liz Ditz’s I Speak of Dreams blog post, Totally False in at Least Two Dimensions “New Study: Baby monkeys develop autism after routine CDC vaccinations”, she takes to task the latest craze in part of the anti-vaccine blogosphere, a 5-6 year old study, published in lower level journals, that seems to show some type of neurological disorder in monkeys after they received standard childhood vaccines. The anti-vaccinationists point to six different articles (three of which were actually conference presentations, one withdrawn, and two others published in very low level journals). They are all based on the same study. And the withdrawn study that uses the great fraud, Andy Wakefield, as a co-author. Andy certainly has a penchant for having articles withdrawn. There is a wealth of problems with the study from low numbers of subjects (testing primates is usually reserved for the most important of medical studies) to lack of randomization to biased observations (apparently only one observer was used to determine neurological function). This study wouldn’t even make a good presentation for a high school science fair, let alone making some sort of conclusion about a medical treatment, especially vaccinations that save lives. And this is the best that the anti-vaccine pseudoscientists can do? Actually, it is. 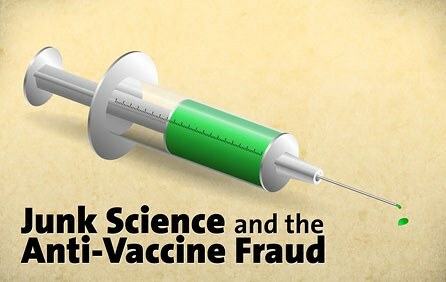 They’ve got nothing else.In the 14 years since Wakefield’s fraudulent study was published, not one single high quality study has shown a link between autism and vaccines. Instead, researchers have spent millions of dollars, money which could have been used for other types of medical research, trying to confirm or refute Wakefield’s fraudulent hypothesis. Because of this absence of progress, one of the hallmarks of pseudoscience, the anti-vaccination crowd must rely upon terrible studies to “prove” their hypothesis. As discussed previously, it’s quite easy to spot pseudoscience in the popular press (and anti-vaccine blogs count as such). The platinum standard of scientific reports are review articles (that combine numerous repeated studies into one meta-analysis) published in high impact, high quality peer reviewed journals. The Cochrane Reviews, the diamond-encrusted platinum standard of scientific analysis, has spoken quite effectively about the total lack of correlation (let alone causation) between vaccines and autism in Using the combined vaccine for protection of children against measles, mumps and rubella. In the end, not all science is the same quality. Well done review articles published in high quality journals can be used to support a point in evidence-based medicine. You should be suspicious of novel primary research (that is, the initial findings or research in support of a new hypothesis), not because it’s novel, but because one set of data from one laboratory needs many more repeats in other labs to make sure that biases and mistakes are not the reason for a particular set of data. You should absolutely discount meeting abstracts or presentations (often the earliest type of communication of new data), because they are never peer-reviewed. Publications in very low impact, biased journals have little value. For example, there is no way that the Journal of Homeopathy is ever going to publish an unbiased article about homeopathy. Critical analysis (without all of the logical fallacies and over-reliance upon weak data) is the only way to understand the evidence to make an important decision about the health of your children. There is just no viable evidence supporting any type of link between autism and vaccines. None. If you’re willing to risk the health of your children by allowing them to get ill from preventable diseases based on ridiculous and fraudulent data, then that is sad.